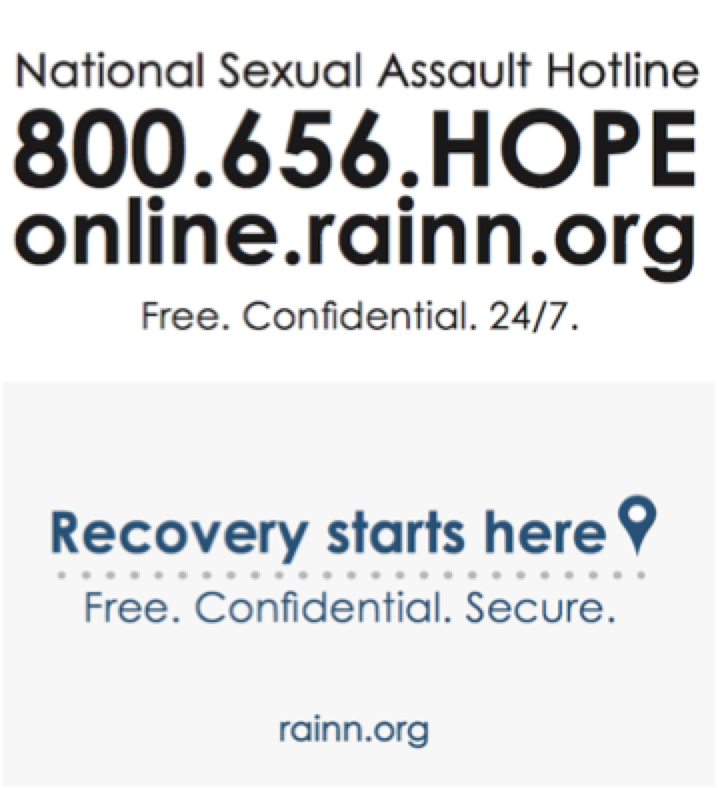 Below are RAINN's handouts, toolkits, infocards, and postcards that you can download, print, and use at your events. You'll also find our shareable graphics to spread awareness through social media. 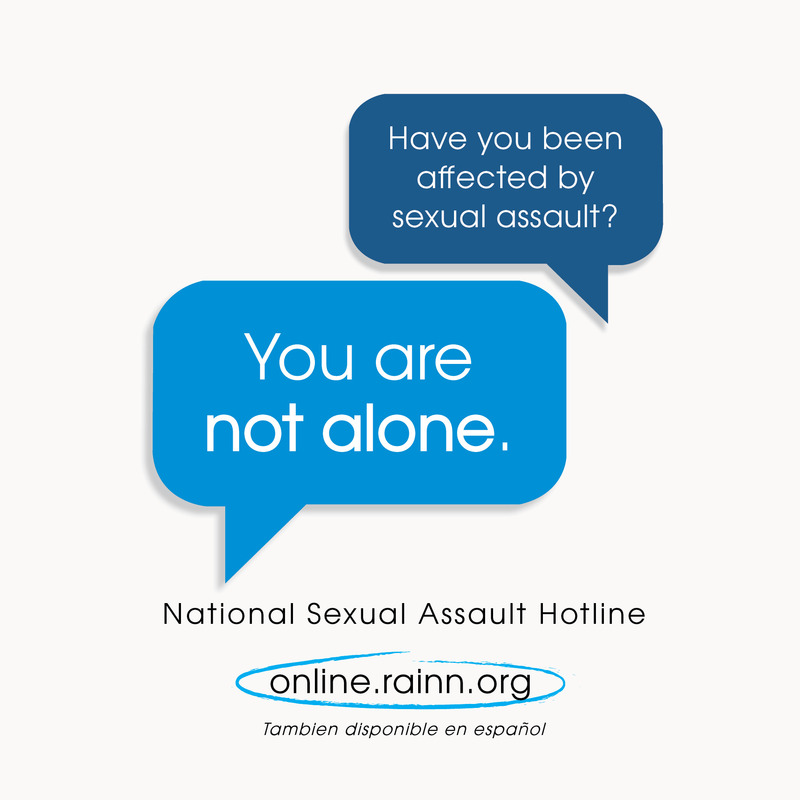 This PDF contains information about RAINN's programs and services and includes key statistics about sexual violence. 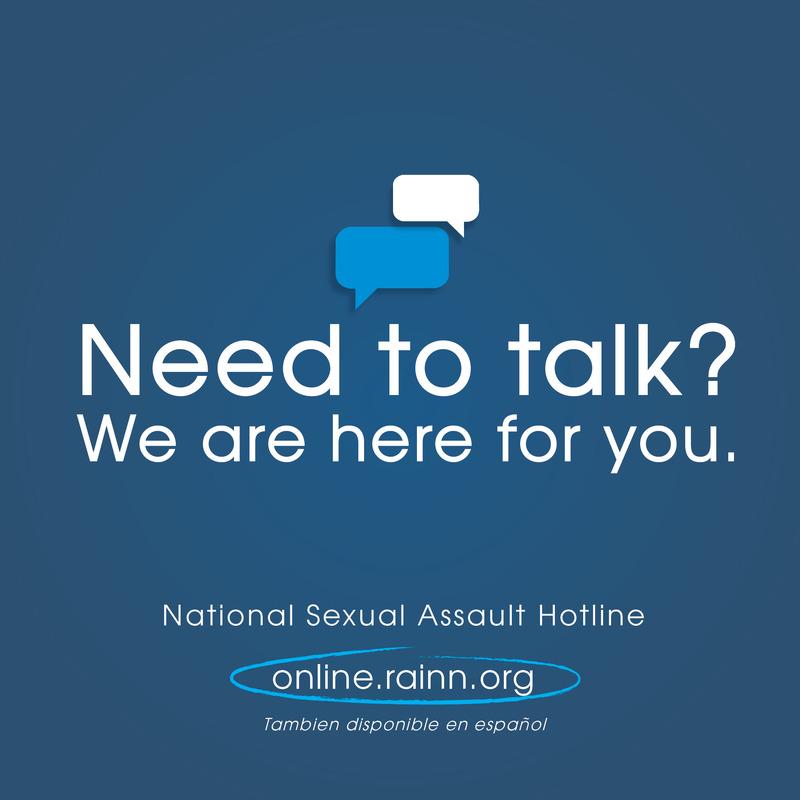 Toolkit for organizations to use to connect people with help using RAINN's services. 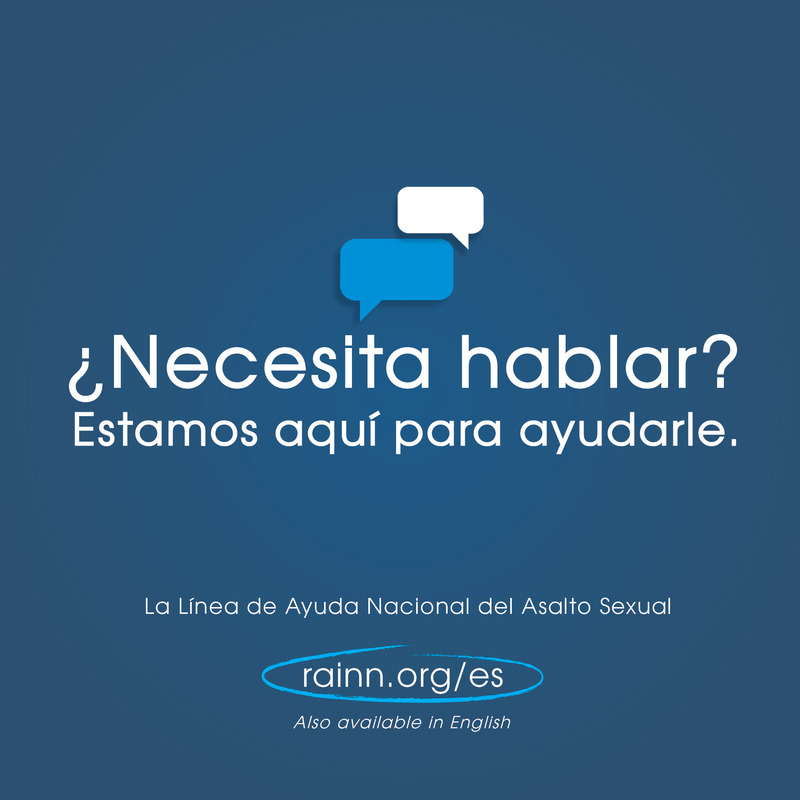 Guía de divulgacioón para que las organizaciones utilizan para conectar a las personas ayuda que utilizan los servicios de RAINN. 5 x 7 card with the contact information for the National Sexual Assault Hotline. Formatted for black/white double-sided printing. 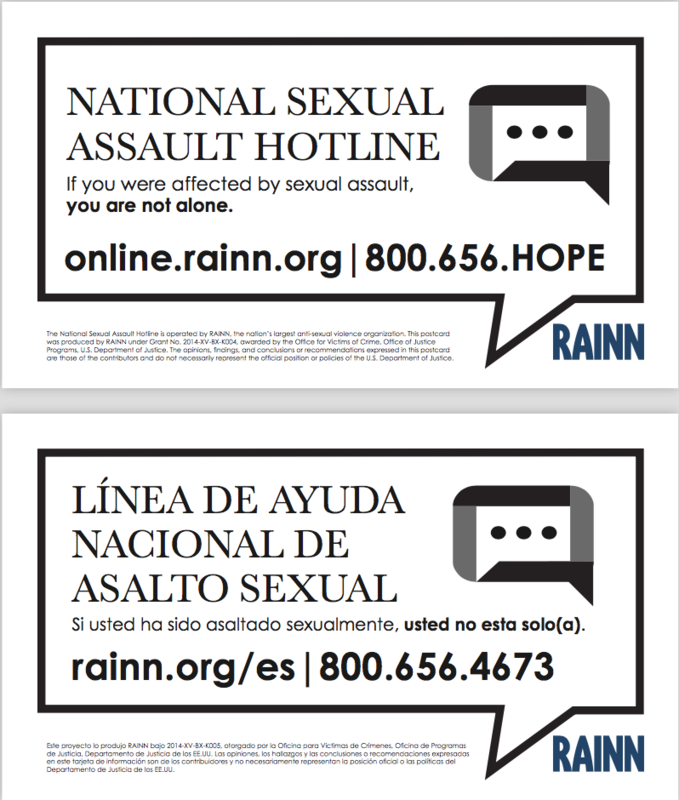 5 x 7 card with the contact information for the National Sexual Assault Hotline in Spanish. Formatted for black/white double-sided printing. 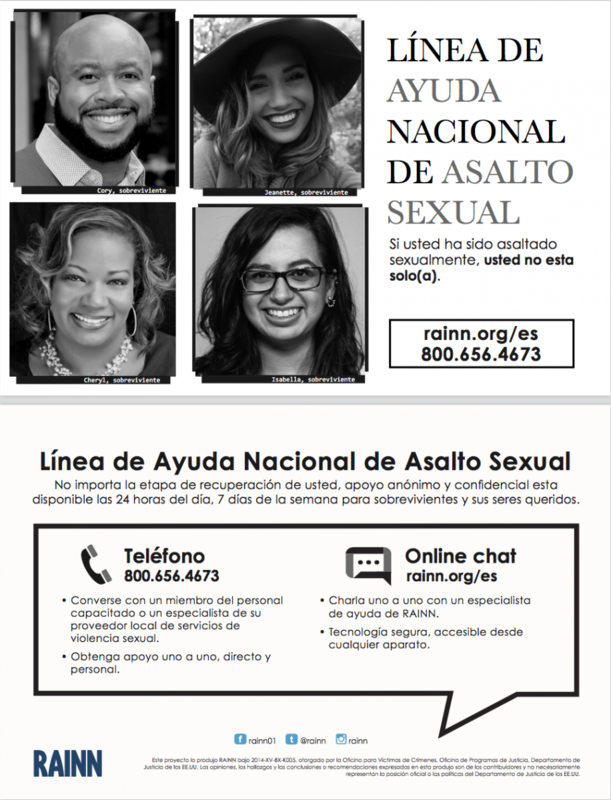 2 x 3.5 infocard with the contact information for the National Sexual Assault Hotline in English and Spanish. Formatted for black/white double-sided printing. 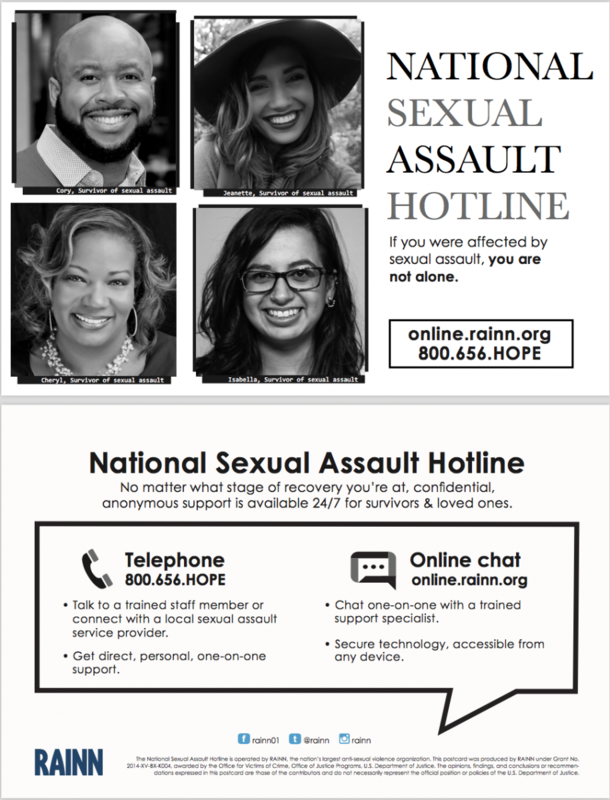 Customizable wallet-sized card with the contact information for the National Sexual Assault Hotline and your campus resources. Formatted for black/white and double-sided printing. 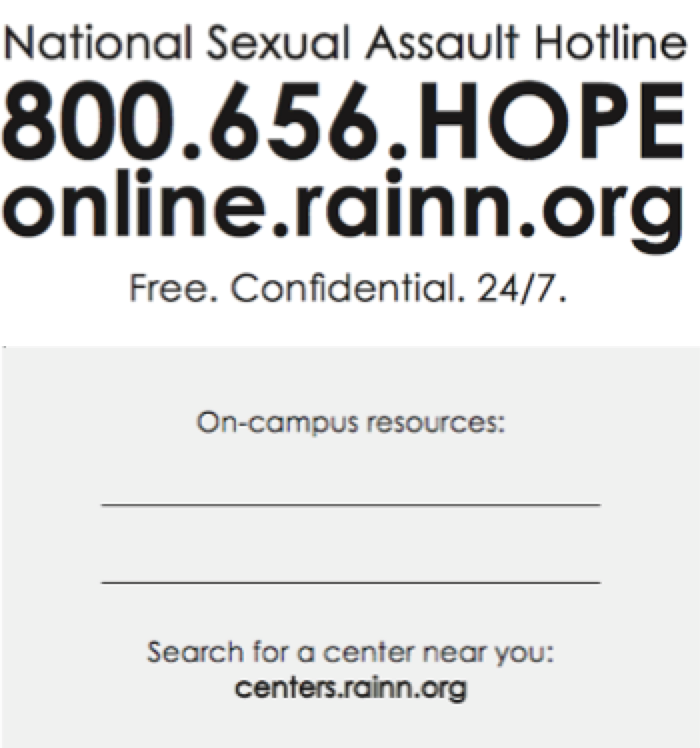 Wallet-sized card with the contact information for the National Sexual Assault Hotline. Formatted for double-sided printing. Help Someone You Care About One-pager with tips and resources on how to help loved ones affected by sexual violence. Self-Care After Trauma Tips for physical and emotional self-care following a sexual assault. Connect even more people with the help they need and deserve. Use the embed codes below to share these graphics via social media or on your website. Embedded images will hyperlink directly to information about the National Sexual Assault Hotline. Want to see and share more graphics by RAINN? Check out these additional graphics below. Online Dating and Dating App Safety Tips RAINN developed these online dating and dating app safety tips, in the form of these sharable graphics, to help you feel as safe and secure as possible when meeting someone new. Let's Talk About... For tips on how to have these conversations, see RAINN's comics on consent, safe dating tips for teens, talking with young children about sexual assault, and talking with college students about staying safe on campus.